AI doors in application development possibilities for the developers. Today, the technology has reached to the next level of advancement, encouraging Machine learning and deep learning for better personalization and recommendation. The AI enabled programming language allows smart search, voice interface and intelligent assistance to improvise the app development. Apart from this, new technique can be added to exciting feature to benefit business. AI has taken smart technology to the next level of innovation, unfolding prospects for different industries. Further, it is expected to reach the human intelligence. 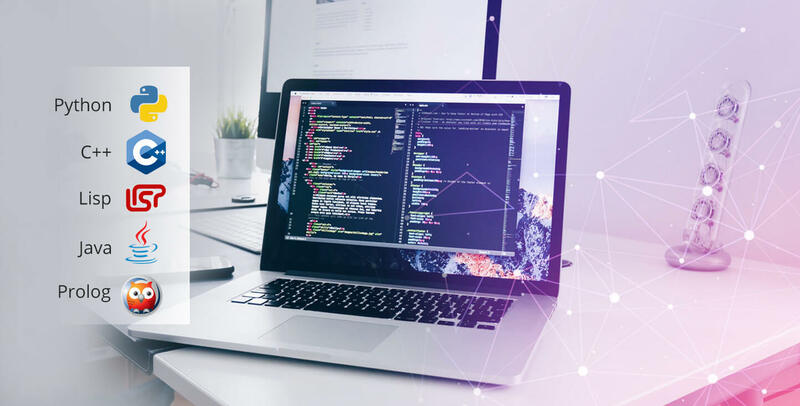 Hence, Off-shore Application Development Companies are endeavoring to explore, and implement its capabilities to meet advanced necessities of human and organization. In AI, if we talk about achievement - biometric intelligence, autopilots for self-driving cars. For such artificial intelligence development projects, different coding language is required. Now the question is, which application development programming language can help to inculcate the insence of AI how it can be leveraged to add profitability. It's not that Artificial Intelligence has its own set of programming language. however, the development company has been working hard hard to use the existing language. The ease of learning, scalability and adaptability has accelerated the popularity of Python, making it one of the fastest growing programming language. Based on DRY (don't repeat yourself) and RAD (rapid application development), this language of developed in early 1990s.Python's object-oriented design increases a programmer's productivity and enables faster development. Without implementation it supports algorithm testing. Hundreds of rich and extensive libraries available in Python make any type of AI project. For instance- Apache Spark MLlib is a very scalable machine learning library. It is very efficient, as it interoperates with the numpy in library Python and R libraries. It is regarded as the fastest computer language worldwide, with faster execution time and quick response time. This is a great language for AI programming as it allows extensive use of algorithms as well as statical AI techniques. part from this, the fast factor makes it an ideal language for AI implementation. It supports code reuse, having features like inheritance and data-hiding. The language is compatible with 3D games complexities. It optimize resource management and facilitate multiplayer with networking. Science fiction game Counter Strike, is prefect real world example. (It uses C++ and the Unreal Engine, a suite of game development tools). Other C++ based application includes Microsoft Windows, Maya 3D software, CAD, Mozilla Firefox and Adobe Photoshop. Introducing idea like dynamic typing, automatic storage management, tree data structure, self hosting and others, this language- Lisp- one of the prominent language, known for unique flexibility. Symbolic expression and computing, makes this language is compliments AI. This means it support programme execution based on symbols computation. Lisp comes as an ideal match for machine learning and inductive logic projects. Java is a versatile programming language that strengthen apps/AI, transparency, portability and maninatinability and matches AI requirement to the best. It facilitate better users integration, debugging ease to well support AI based large scale project. Apart from this, Java Virtual Machine technology in Java language supports creation of single app version. This means the app will support all Java-based platform. Like Lisp, Prolong is a primary computer programming language suitable for development of programming AI. It offers flexible and powerful framework for developers. It is used for non-numerical programming, processing of natural language, theorem proves. Having formal logic, this declarative is used by AI Application Developers for high level abstraction, pre-designed search mechanism and etc. With the core expertise in AI languages like Python, Java, and C++, we specialize in advanced application development. Leverage top-notch and in trend AI technology, to offer desired functionality depending on the industry vertical. NEXT POST Benefits Of Hiring Professional Ecommerce Web Design & Development Company!